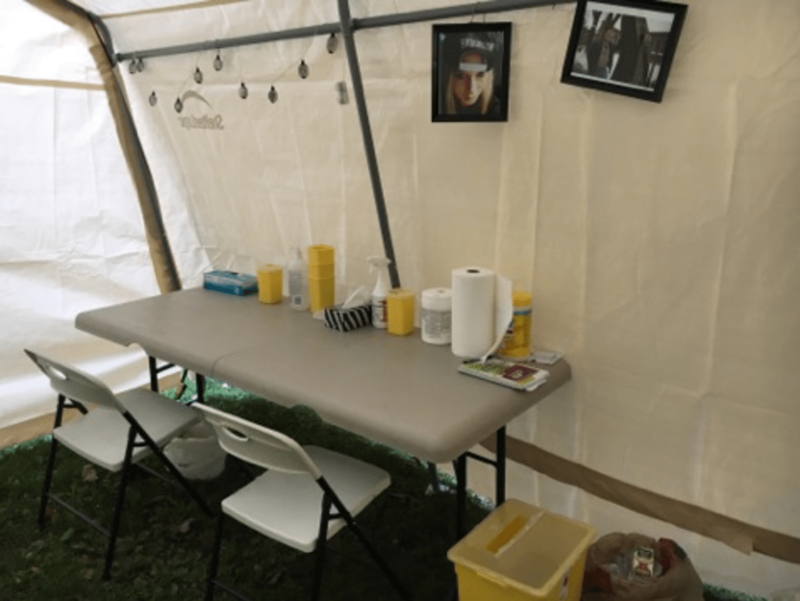 The organizers behind the ad hoc supervised injection site in Moss Park have no intention of shutting down now that the City has opened its own interim site, says Zoë Dodd, a harm reduction worker and one of the site’s organizers. A group of harm reduction workers began operating out of Moss Park last week to provide a space for people to use injection drugs safely and, if need be, to be revived of an overdose. Dodd said they’ve also been doing community outreach and have handed out 200 overdose-prevention kits. 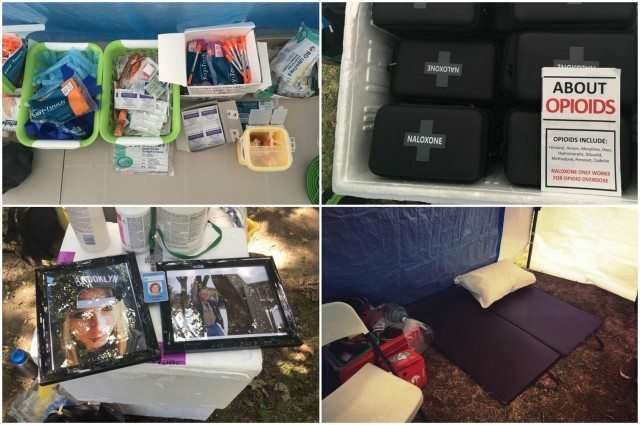 It was a response to the fact that, while the City plans to open three supervised injection sites in the fall, there are people using drugs and dying of overdoses now—by the City’s estimate, there were 325 overdoses in the past month. That’s likely below the real total, according to Dodd, since it’s based on emergency room visits and many people don’t report their overdoses if they’re not admitted. And they can’t wait until the City is ready to roll out its permanent facilities. 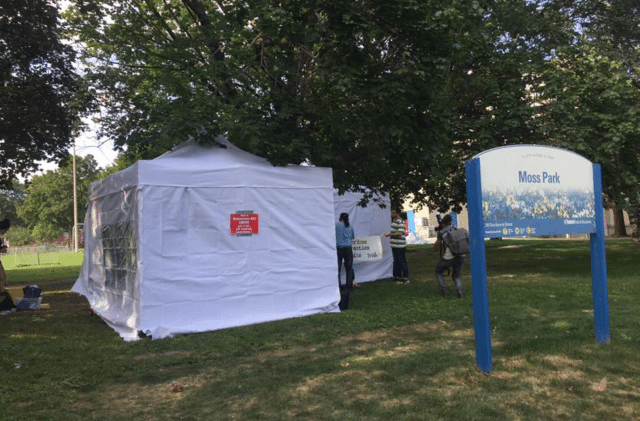 In the week since the Moss Park site opened, the City quickly moved to set up its own interim supervised injection site, which opened Monday at The Works needle exchange program at Victoria and Dundas streets. 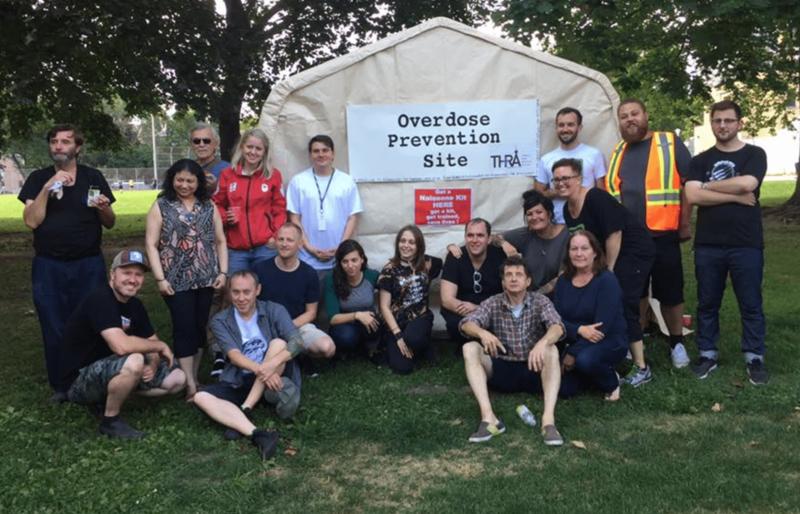 The temporary safe-injection site, which will be replaced by three permanent sites this fall, will operate Monday to Saturday from 4 p.m. to 10 p.m.
Photo via the Toronto Overdose Prevention Society. Dodd is pleased that the City is taking this important step, but says the people using and staying near Moss Park also need a space, and so they have no plans to close their site. Instead, they’re working with the City in hopes of finding an indoor space and gaining permission to operate legally. She credits the City with taking the overdose crisis seriously, and says a recent meeting with the mayor and front-line workers seemed to have an impact. Dodd is less pleased with the provincial government, which she says has failed to adequately address the crisis. From long-term underfunding in harm reduction and a failure to declare a public health emergency to the fact that there isn’t someone tasked specifically with overseeing the government’s response, Dodd is critical of the Wynne government’s absence in the face of a serious and ongoing health crisis. Dodd says the provincial and federal governments need to begin seriously discussing decriminalization of all drugs, making heroin available by prescription, and other steps that would allow people using drugs to do so without risking death or prison, adding that the legislation regulating safe injection sites should be changed to make accessing legal sanction and funding much easier. Earlier this month, de Villa announced she is calling for a public discussion on the merits of decriminalizing all drugs. “It’s clear that our current approach to drugs in this city and this country doesn’t seem to be having the desired impact,” she told reporters at a news conference. Last year, it’s believed more than 2,400 Canadians died as a result of opioid-related overdoses, the Star reports. In the meantime, Dodd and the other volunteers will be running the site they set up at Queen and Sherbourne for the foreseeable future.